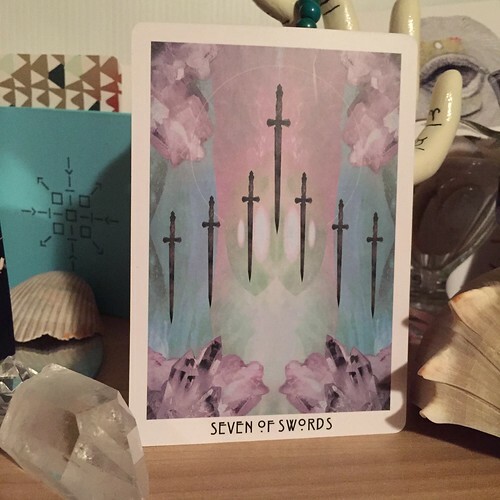 Though it feels like an unsettling card, the Seven of Swords is a pretty good reminder to watch our backs in more ways than one. Usually this card has some sort of sneaky imagery on it but because they’re all out in the open in the Starchild, it’s asking us to take a look at the situation head-on instead of assuming knowledge or being sneaky ourselves. 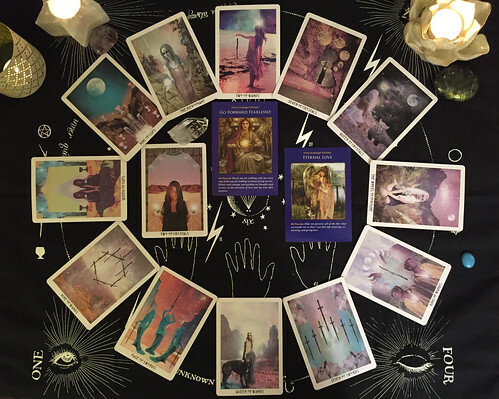 We have followed our King of Wands fire, did we accidentally overshare? Are there people who aren’t being supportive to you about your goals? Are you not being truthful to yourself about your goals? I think this is a reminder to get really, fully clear on your goals. Are they too lofty? Sometimes I feel as if my goals are a little too out of reach. Okay, so how can I get to them? I can’t just shotgun my way to my goals, can I? Neither can you. So, how can we be lovingly honest about our goals and how to get them? What can we do? We can most definitely be passionate and share with others, of course! But we also need to take care of ourselves as well. Are we giving away too much? Are we asking for too much? Are we trying to side-step the hard work? This month, let’s cut to the truth of every, and I mean EVERY, situation in our lives to make sure it’s in our best and highest good. Let’s start being a little more honest with ourselves, and others, about our next steps. Where is it that you need more clarity? Personally, as I’m writing this, I’m pretty sick. It’s no fun being sick during the summer but it’s also a reminder that my self-care comes first, no matter what. How appropriate for a mid-year check-in, no? How is your year going so far? I’d love to know!